For years, I struggled with bouquet holders. As an accomplished flower designer and creative director for many of the Flower Industry Most Popular Wedding Guides… I knew there was an opportunity to create a bouquet holder that would give excellent results! I was approached by the FloraCraft Company to create a wedding bouquet holder…I sketched out a picture and VOILA…the Gala® Bouquet Holder was born! The Gala® Bouquet holder is the BEST Bouquet holder on the market for one basic reason…it was designed by a Flower Designer…to help you create Beautiful Wedding Bouquets! The features and benefits of this mechanic are described in this week’s video…including the ergonomic clear handle, color-enhancing handles, design portals, foam choices and more! 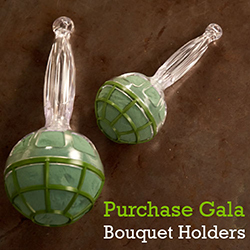 I’m delighted to have designed the Gala® Bouquet Holder…and I’m confident that you’ll find it easy to create just about any style of bouquet…with Gorgeous Results!